If the kayakers had not heard their cries for help, the six puppies would most certainly be drowned. Two kayakers were paddling on the Blackstone River in Massachusetts when they heard a whimpering sound coming from an old potato sack bobbing in the water. They went to investigate, and to their alarm, found 6 puppies inside. 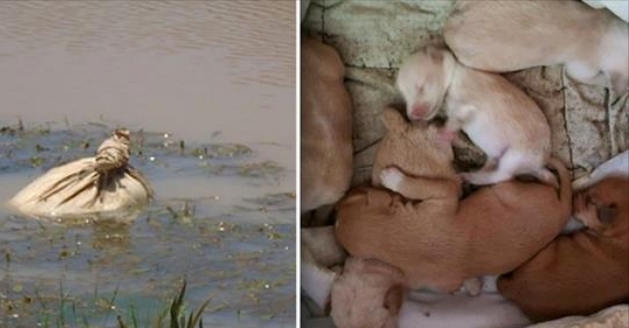 The puppies were only one-week-old had had been tossed in the river to die. “It’s unconscionable, you can’t imagine what’s going through my head as a police officer for 29 years, someone would do that, someone would take six fairly newborn puppies and discard them in a body of water,” said Uxbridge Police Chief Jeff Lourie. The puppies were taken to Uxbridge Animal Control, which right away put them on a special milk formula. The department was soon flooded by calls from concerned citizens asking after the puppie’s welfare and whether they could adopt them. A few weeks on, and the puppies are doing well and continue to be well-looked after by the staff at Uxbridge Animal Control. The puppies are not yet ready for adoption, but should be around mid November 2017. Uxbridge Police Department is asking that interested adopters keep an eye on their Facebook page for updates as to when the puppies will be ready for adoption. The UXPD also says that the investigation is continuing and that “the $5000.00 reward for information that leads to the arrest and conviction of the individual(s) responsible for this unconscionable crime” is being offered. Responses to "Kayakers See Potato Bag Floating In River And Hear Whimpering Puppies Inside"
Can you imagine the trauma that poor mother went through when her puppies were taken.